Visual Expression: A peek into the projections of imagination. HAVEN cover art. 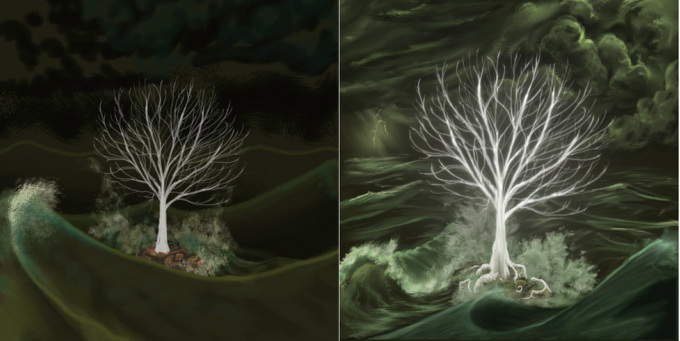 A rough concept sketch (left) and the final image (right). Book of words. Book of pictures. When I was a child creating my far away imaginary worlds, each story I wrote was accompanied by a pictorial encyclopedia. These were two separate works, one in support of the other. Within this encyclopedia (a folder stuffed wide with pencil and ink drawings), you could find world, regional and city maps, cultural and architectural designs, character sketches, and most commonly, the concept art and biology of my many invented creatures. Then, my drawings outnumbered my words. As an adult, the scales of my life have tipped in the opposite direction. Still, we are who we've always been. I didn't mean the "royal we" by that... or did I? At this point in my life, I feel like I express my creativity most adequately by writing, but art is still very much a part of who I am. I still draw maps, creature bios, and if I have the opportunity, feature my own art alongside my projects. I am also very open-minded and love artwork done by others. We each imagine something slightly different when reading, and I love seeing the unique results that fan art yields. 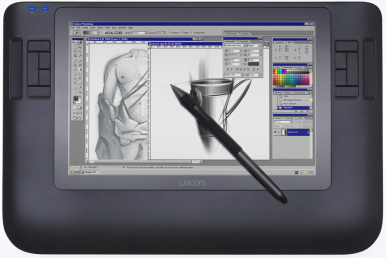 I sketch in both pencil and pen, and occasionally do acrylic paintings, but my love of all loves is my Wacom Cintiq. I'm sure in the time it has taken to post this, my Romeo of graphical hardware is already out of date. I swear, keeping up with technology is like trying to board a bullet train that's moving 300 miles an hour. Goodbye fingers! Did I forget to mention that your fingers are your life savings? Goodbye money! They call it "cutting edge" for a reason. I digress. I have used Wacom tablets since 2000 (Intuos 1), and my Cintiq is the best way I've spent my hard earned cash in years, if not my life. Oh, and my Cintiq is a "he", and his name is Shenlong. Yes, as in Chinese for "spirit dragon". Minor relation to the wish granting dragon of Dragonball and the massive metal mobile suit of Gundam Wing.